This page has information for online resources from the book “My Parent Plan – How to Create A Family Project Plan to Organize Your Life and Your Kids” by Beth Blecherman. I was in NYC for the book Expo, here was the details: My Parent Plan at Book Expo of America!. UPDATED VERSION RELEASED : “My Parent Plan” – Learn to apply professional project management concept and skills for parenting, the toughest but best project you will ever have! 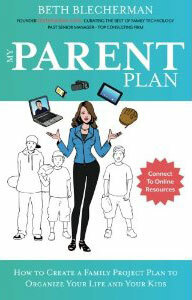 “My Parent Plan” is available on Amazon (CLICK HERE to buy). “Implementing a family plan is a very interesting premise, and Beth’s book provides a very excellent way to do it.” Guy Kawasaki, author of Enchantment and former chief evangelist of Apple. “My Parent Plan has impeccable advice on every page. It covers topics from communication, date night, finances, and health to the art of delegation and managing the rocky waters of the teenage world. A must read for any mom who wants to organize her family’s world!” Kimberley Clayton Blaine, author, spokesperson, social media personality and executive producer of www.TheGoToMom.TV. As parents, it’s a daunting task to effectively coordinate your family’s daily schedule between work, home, school, childcare, sports, hobbies, community projects, friends, family and everything else in your busy lives. Blecherman offers a step-by-step guide to organize your family’s schedule, taking a practical approach to coordinate priorities and activities inside and outside your home. With a “Parent Plan,” you’ll no longer say to yourself, “I could have done THAT… if I had just been more prepared.” My Parent Plan will give you confidence to respond in a way that’s best for you and your family, resulting in happier parents, happier children and a calmer household! Online Resources: In my book, I explained that because of how fast technology changes – creating an online resource page will allow me to try to keep as up to date as possible with the online resources available to parents related to creating their plan. Here is a link to the category that will have posts and links to MY PARENT PLAN RESOURCES. Please read the book to understand the overall planning process and use the online resources as background or information for creating your own parent plan. TechMama’s My Parent Plan TIPS for families, Tech Tool Tips and My Parent Plan EVENTS boards. BETH BLECHERMAN is the founder of the popular blog TechMamas.com (Twitter @TechMama) that offers tips, trends and advice on family technology and social media. Beth is well known for articles in Mashable.com and can be found on lists such as Time 140 Best Twitter Feeds, PC Magazine’s Twitter Top 100, WorkingMother.com’s List of Most Powerful Moms in Social Media, and Forbes’ Top 100 Website for Women. With three young boys (and TechDad) in the home, Beth transitioned from her position as Senior Manager at Deloitte to Family Management, then used social media to create her Career 2.0. She currently consults with companies in the family technology market to test and provide feedback for products, apps and websites.